Your tour begins on the ground floor of the attraction where there is also a decent sized coffee shop and chocolate store known as the Chocolate Bar, but after buying your ticket, you travel by lift right to the top of the building. After the introduction, the first part of the tour is a room where the origins of chocolate are explained with a cine screen. You also get to taste a bit of cocoa water, which is particularly unpleasant! For us, the tour really came to life – quite literally – in the room next door though. You walk into a room decorated with photographic portraits of some of the people who brought chocolate to York and as the tour guide speaks, they come to life, Harry Potter style, and interact with the tour guide and each other. Very clever! The next room has real photos from the past and you learn about some of the people in them and then you move down a floor to the demonstration area where the first thing you see is the “Chocolate Factory”. This is an interactive desk which is explained by a host and shows you how chocolate is actually made. The children on our tour enjoyed spinning the wheels and pulling the levers to make it all happen. After this, there’s a handy dose of nostalgia with chocolate bars and commercials from the past and finally the section of the tour where chocolate is made in front of you and you get to taste some too. The timings were a little off on the day we visited, so we had to wait downstairs past our tour time before we could begin and when we got to the chocolate making, a group in front of us had just finished. As such we had to wait around a while before the next demonstration began. All in all though, we thought it was an enjoyable experience, but we could have done with a bit more chocolate and the timings needed to be better organised. York’s Chocolate Story is open daily from 10am to 5pm. Adult admission is £9.50 on the door or £8 if you buy online in advance (2012 prices). Tickets are timed as tours begin every 10-20 minutes. 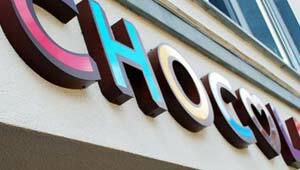 The chocolate bar is open daily from 10am to 6pm but there are later closing times at peak periods.